The area was declared federal territory in 2001, and was named after Malaysia's first Prime Minister, Tunku Abdul Rahman Putra, with the word Jaya ("success") added. Kuala Lumpur remains the country's premier capital. Putrajaya's 5,000 hectares are very much a work in progress, envisaged as an "intelligent garden city", with 40% devoted to greenery and landscaping. Some original rubber trees and oil palms in the area were kept. Malaysia's largest botanical garden, Taman Botani, is in Putrajaya. Putrajaya also has the massive, man-made Putrajaya Lake, public parks and wetlands, plus a high-tech communication and information systems and an efficient road and rail network. The air is fresh, and traffic is light. The main attraction of Putrajaya is the stately and beautiful Putra Mosque by the lake. Putra Square faces the mosque. 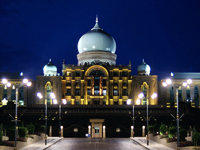 The Prime Minister's official residence, Seri PErdana, is also in Putrajaya. Most of the population consists of government employees on subsidized housing. The architecture is eclectic, with Arabic inspiration prominent. The new IT-oriented district of Cyberjaya lies just west of the city. A high-speed rail system links Putrajaya with Kuala Lumpur and the international airport in Sepang. The city is open to the public from 9 a.m. to 5 p.m. every day.